South Korea’s military says joint survey does not clash with international sanctions imposed on North Korea. 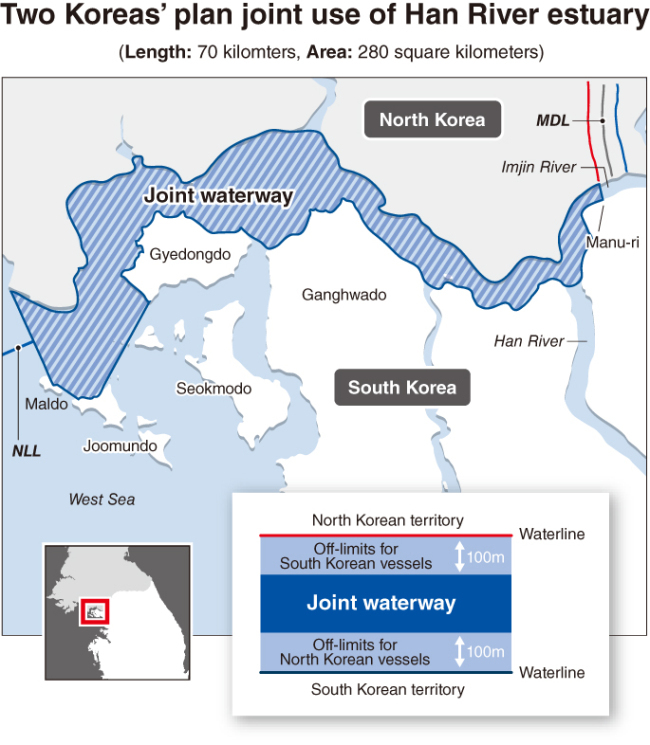 Since the end of the Korean War in 1953, access to the waterways along the western border with North Korea have been largely restricted out of concern that cross-border skirmishes could escalate into major conflicts. 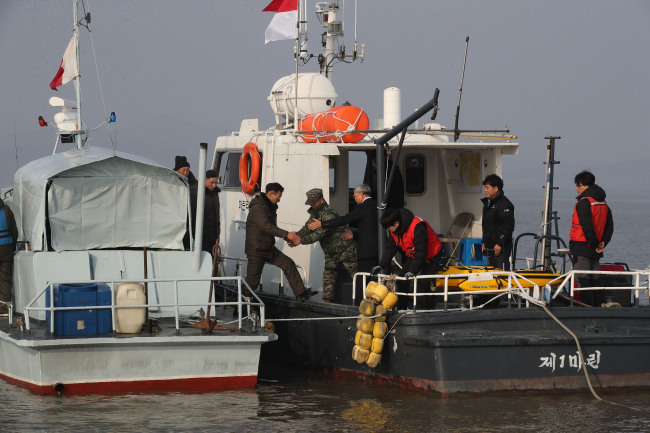 While the armistice agreement allows for freedom of navigation at the estuaries of South Korea’s Han River and North Korea’s Imjin River, such activities have been mostly prohibited unless for military purposes. 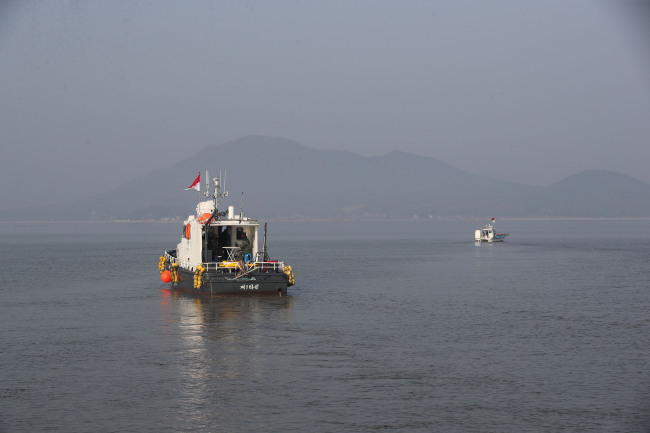 Now, off-limits sites are about to open up themselves to the public for the first time in 65 years, as the two Koreas on Monday kicked off a joint survey of the waterways to prevent cross-border skirmishes and speed up inter-Korean projects. Following the inter-Korean summit in Pyongyang in September, the two Koreas’ defense chiefs agreed to conduct the joint survey until the end of the year to ensure freedom of navigation by civilian vessels. Five vessels participated in the joint research, with the South sending four ships and the North sending one. The ships carried a 20-member joint survey team with 10 people coming from each side, mostly military officials and waterway experts. The joint survey was scheduled to kick off at 10 a.m., but was delayed until about 3 p.m. Military officials here attributed the delay to the ebbing tide that has made their navigation through the waters difficult. “The two Koreas shared their equipment to conduct the survey. Even though the waterway is low, we don’t think there will be significant challenges. Our research focuses on the waterway and maritime territory,” a South Korean Navy official said, requesting anonymity due to office rules. The South Korean government has expressed hopes that the joint survey will help boost tourism projects by allowing free access to the restricted area that has been off-limits to the civilians for 65 years. The government also expects that the joint use of the cross-border waterway can improve the prospects of the inter-Korean projects, such as in collecting massive aggregates for construction and other commercial uses. In a document released after the inter-Korean military pact was signed, the Defense Ministry said the two Koreas will jointly collect construction aggregates and distribute the benefits to each other. “When we pursue the project in the future, we will come up with military measures to ensure that the project will be carried out within the framework of international sanctions,” the ministry said in the document. There are concerns, however, that if the South Korean government purchases aggregates collected from the northern territory of the estuary, it could clash with international sanctions imposed on North Korea. Under UN Resolution 2375 issued in September 2017, “forming joint ventures or cooperative entities” with North Korea is prohibited. Additionally, any product manufactured using North Korean labor is banned from US commerce. Military officials participating in the joint research said what they did would not constitute sanctions violations so far, as it is still in the stage of “joint study” and no decision had been made yet regarding the inter-Korean projects. “If we come up with some results, there might be issues regarding sanctions. But what we are doing is basic research, so we believe there will be no significant issues,” said a South Korean Navy official, requesting anonymity due to the sensitivity of the issue. In a text message sent to reporters, the Defense Ministry said Monday that the primary purpose of the joint research is largely for preventing military clashes, and relevant organizations will have further discussion on the inter-Korean projects at the cross-border waterways.